Posted on Tue, Apr 17, 2012 : 5 a.m.
Bidding is a two-edged sword if you do not become the declaring side. You might have helped partner to find the killing lead, but you might have told the declarer how to make his contract. In this deal, North chose to describe his hand accurately, wondering if his side could make a slam. But it helped the opponents to find the killing defense. 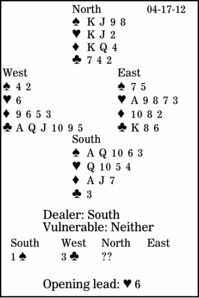 After South opened one spade, West made a three-club weak jump overcall, showing a good six-card suit and 5 to 10 high-card points. What should North have done next? To counteract a weak jump overcall with support for partner's major, bid one level higher than you would have done if the opponent had had the courtesy to pass. So, a three-spade response shows a decent single raise. A jump to four spades promises the values for a game-invitational limit raise. And a four-club cue-bid indicates a game-forcing raise. Here, North chose the cue-bid, but it gave East the opportunity to double to show a high club. Now, when West had to lead against four spades, he led his singleton heart, hoping his partner held that ace and confident his partner had the club king as an entry. East won with his ace and returned the heart three, his lowest card being a suit-preference signal for clubs, the lower-ranking of the other two side suits. West ruffed, underled his club ace to give East the lead with his king, and a second heart ruff defeated the contract. True, if North had responded four spades, the defenders might have found the same defense, but it would have been harder.